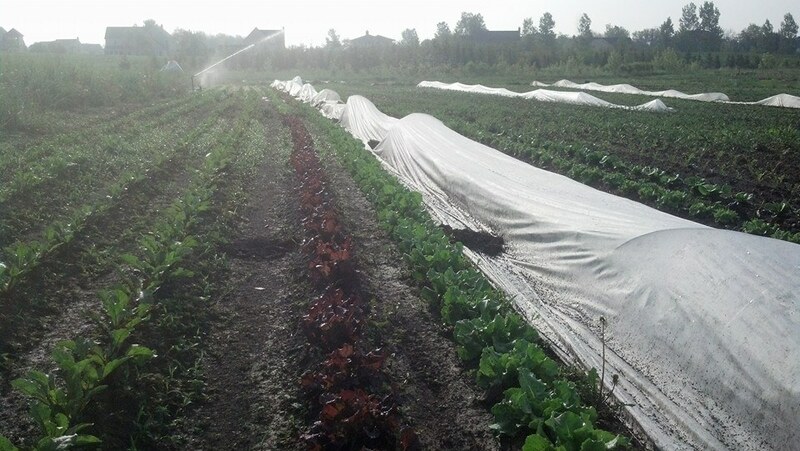 May is a make-or-break month for vegetable farmers in the Midwest. After the flurry of planting and seeding that is March and April, May is the month during which our early crops establish themselves. May can be fickle around here – it can be blistering hot or chill and wet. Any Chicagoan who has lived here long enough can remember a graduation ceremony, wedding, or end-of-the-year picnic that was rendered miserable due to a sticky heat wave or an unseasonable stretch of cold rainy days. And if we think we have it tough, just think about the plants that have to navigate the meteorological rollercoaster that is the Midwestern May. The first harvest of the season is always nerve-wracking for us. We spend the weeks before the first market watching the spinach grow and checking our seed catalogs to remind ourselves just how long it should take for that lettuce to head up. This year was no different – we had several weeks of unseasonable cold, followed by abundant rain that flooded our kale fields and washed out our seedings, which in turn gave way to a hot, dry spell. We say it every year, but the simple truth is that every spring is unique, and the only way to beat that is to plant a variety of crops and take a deep, calming breath. While we were waiting to see how the spring greens would shake out last week, we had plenty else to keep us busy. Jac, Adam, Peter and Mr. Muddana planted over 4,000 tomato and pepper plants, which benefited from the gentle rains. 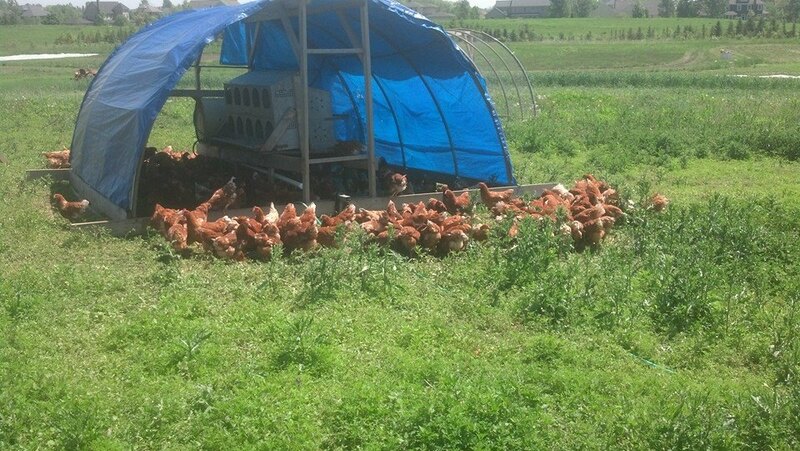 Nick helped our 300 laying hens adjust to their new home in the field – they were less excited about the rain, I think. And our Saturday work-share participants spent their first shift hoeing up a storm in the onion field. Always a lot to do, and always a lot getting done! 1. Generally, the best way to store greens and leafy things is in the fridge, in some kind of plastic bag or container. Since we try to keep our packaging to a minimum, sometimes you will receive items that need to go in a bag before they go in your fridge. All of the bags you will get from us are compostable, but can be reused at home. When an item has special storage requirements, we’ll let you know. 2. Please wash all your produce! We rinse all our veggies before packing them, but you should always wash them again, preferably right before you cook with them or prepare them. If the vegetable will hold up to scrubbing, do that; otherwise it is sufficient to run the vegetable under water and then shake or spin dry. 3. It is best to eat your produce within the week, since vegetables are healthiest and most delicious when they are fresh! If you have trouble getting through all the vegetables, we will offer some tips about freezing or preserving food from your share, but we also advocate sharing with your friends and neighbors! Store the mushrooms in a paper bag in the fridge, or in a container covered with plastic wrap with a few holes poked in it. Oregano and asparagus can be placed in a jar of water, like a bouquet, and kept in the fridge. Extra oregano can be dried for later use – tie the bunch with twine and hang it in a dark, well-ventilated place until dry, remove leaves, and store in an air-tight jar. Baby Red Russian kale can be cooked as you would larger kale leaves, but is also tender enough to be enjoyed raw in salads. Pea shoots are a delicious addition to salads, as well, and can also be sauteed lightly and tossed with pasta. Mushrooms and asparagus are both delicious when brushed with olive oil, seasoned, and grilled. Mushrooms can be loaded onto two parallel skewers for ease of turning, and asparagus can be skewered crosswise onto three parallel skewers. Chive flowers are edible and a gorgeous addition for any salad or pasta dish – pull them apart to create a beautiful purple garnish. The flower stems can be woody, so remove them before preparing the more tender vegetative leaves. A sprinkle of the chives themselves is a versatile and ubiquitous garnish for almost any savory dish. Fresh oregano bears almost no resemblance to the dried flakes you find on the table at pizzerias – it has a bold, almost minty flavor that works well in marinades and salad dressings. Combine all ingredients and whisk together. 1. Chop kale leaves into bite-sized pieces. 2. Place the kale in a mixing bowl along with the olive oil, lime juice, and salt, and toss well with your hands, working the dressing into the greens. 3. Mix in the avocado, cumin, cayenne, nuts and raisins or craisins. Chop spinach in a food processor with garlic, nuts and Parmesan until well blended. With machine running, gradually add olive oil; process until smooth. Season to taste with salt and pepper. Serve at room temperature. 1. To make the dressing, combine the garlic and salt on a cutting board. Mash into a paste using the flat side of your knife. Place in a medium bowl or jar, then add the buttermilk and vinegar. Whisk together, then gradually whisk in the olive oil. 2. Steam the asparagus in a basket steamer over a bit of water in a skillet. Drain, then transfer to a cold water bath to stop the cooking. Set aside. 3. Just before serving, combine the asparagus, beans, and sprouts in a large bowl. Coat generously with a splash of the buttermilk dressing, and toss well. Snow on mushroom. Maybe the last winter for this crabapple tree. Ray was up late washing your eggs, don't forget to pick them up!